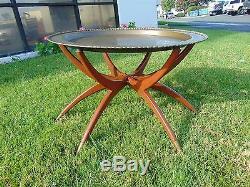 Antique Chinoiserie BRASS CHARGER Folding MAHOGANY COFFEE TABLE Chinese ASIAN. My feedback speaks for itself. Please feel free to check out our other unique listings by clicking. The solid brass charger sits on a 6 legged mahogany table, which fans outward and folds in when not in use. Each of the legs has a brass capped foot and a rubber piece which holds the charger in place without scratching it. There were many similar less expensive (and less well made) versions of tables like these- and this isn't one of them. High degree of craftsmanship, masterful etching, and applied trim. The brass tray is 100% hand etched done with various images of animals including the tiger, peacock, dove, rooster, and elephant. It can be used as a serving tray, as a table on wooden support, or as an exotic arrangement on the wall (has hook for hanging). Overall, at least very good condition, I'd say. Please take a good look at the photos. 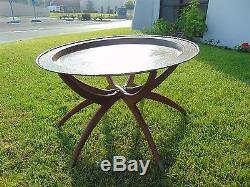 Measurements : Charger measures 29.5 inches in diameter Folding table measures 18 inches tall. Table sits 19 inches tall. I guarantee the item to be as described. Questions: Feel free to contact me with any questions. Powered by SixBit's eCommerce Solution. The item "Antique Chinoiserie BRASS CHARGER Folding MAHOGANY COFFEE TABLE Chinese ASIAN" is in sale since Tuesday, November 15, 2016. This item is in the category "Antiques\Furniture\Tables\1900-1950". 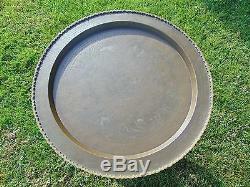 The seller is "akachuck" and is located in Anaheim, California. This item can be shipped worldwide.